Joe hill's "The Fireman" was a terrible book to read in the final countdown to the bar exam. It was too compelling, too intriguing, too good at keeping me on the edge of my seat. So, it'll likely make a great summer read for anyone not trying to stay motivated in the home stretch of bar prep. The world has been beset by a plague called Dragonscale, where the infected develop scale-like markings on their skin until they spontaneously combust. No one knows where the infection started or how it spreads, and people are panicking. Harper is a nurse who spends her days caring for the infected. She made a suicide pact with her husband in the event they become infected. Harper's plans change, though, when she learns she's pregnant and becomes infected in quick succession. Now she has to figure out how to survive long enough to give birth to her child. Rumors are circulating of a man who has learned how to control the Dragonscale so that he does not ignite, and that he might even be able to control the fire and use it for his own purposes. Harper sets out to find the Fireman & figure out how to live long enough to give her baby a chance at life. Joe Hill is Stephen King's son, and the influences are apparent in the best ways. He writes a tight thriller that kept me on the edge of my seat. It's got horror elements, but in the sense of King's "Under the Dome," where the paranormal is a pretense to examine humans & our responses to panic as the true villains. Though it's a horror thriller by genre, the action-packed sequences were my least favorite, and the book would have been stronger if it had minimized those to focus on the interpersonal dynamics. Harper is a wonderful protagonist - strong, determined, and believable. Kate Mulgrew (from "Orange is the New Black" and reading & narrating her own excellent memoir, "Born with Teeth") does the audio narration and truly brings Harper to life. I could not think of a better match, and highly recommend the audio format specifically. Harper finds a cohort of like-minded individuals, and watching her navigate among the various personalities is the true core of the novel. Mulgrew's distinctive voice gives the reader the clear feeling of being inside Harper's head, evaluating the other characters and the world around her as she does. Verdict: Affirmed. If you're an SFF fan looking for a fast-paced summer read, definitely check this one out. 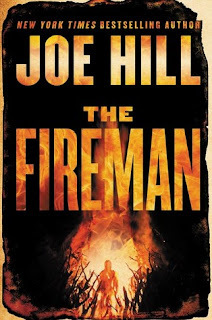 "The Fireman" by Joe Hill, published May 17, 2016 by William Morrow. Audio narration by Kate Mulgrew, published May 17, 2016.